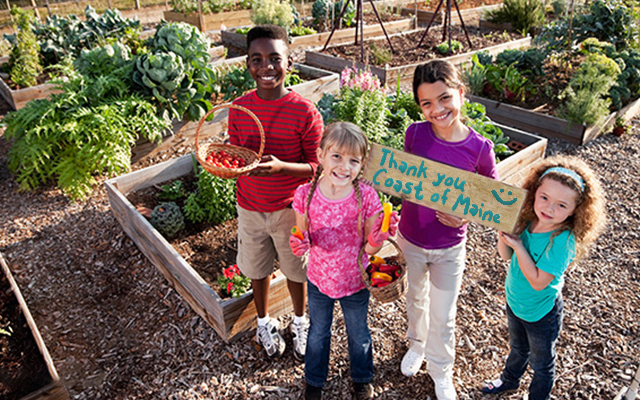 Growing Good Program – We Donate Coast of Maine Products to School Gardens! At Coast of Maine, we believe in supporting education, local retailers, and empowering students to make healthy physical, emotional and environmental choices. Instead of a monetary donation, we happily donate Coast of Maine products to school gardens. All New England area schools are welcome to participate, and the process is simple! School garden coordinators need to contact Coast of Maine’s Director of Marketing, Cameron Bonsey. Cameron will coordinate with your local Coast of Maine retailer to donate up to 10 bags of soil for you to pick up! Our donation helps fund your program and will bring the local retailer closer to the community. It also serves and acts as a seed starter for the kid’s lifelong love of gardening, health and the environment. In short, we all win. Terms and Conditions of Donations: Coast of Maine has a limited budget for charitable donations and cannot guarantee all requests will be fulfilled. We ask that donation requests be made at least 30 days prior to your planned planting/use date for consideration. -All donation requests will be evaluated on a case by case basis for approval.